From the 3rd November new charges will apply for delivery of passports in Spain and Portugal. Provide uniformed, identifiable staff and provide a secure service. British Consular Services Iberia has negotiated a very competitive and comprehensive deal for passport customers with DHL Express. This compares very favourably to prices charged by other companies for secure delivery of important documents, particularly as it includes a number of additional features such as advance customer contact in English. Further information on this service, including delivery times, prices and tracking, will be published on the British Embassy website from 3rd November. You may also consult DHL’s website for further information on their services. After the island’s Cabildo had to bail out Titsa Bus Company to the tune of €23 million last year, there are calls for a massive rethink. Another €13 million was added to that figure from the regional government and Madrid, the total amount of public money used to keep the company operating has amounted to €36 million. Critics say the company is over staffed and current routes are poorly-planned. 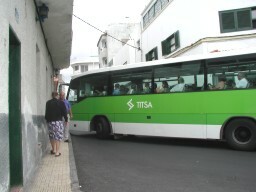 TITSA was taken over by the Cabildo last year in a bid to streamline public transport provision in Tenerife following the entry into service of the tram link between the capital and La Laguna. The funding revelations call for changes at senior management levels in TITSA. It was announced earlier this week by the President of the Tenerife Cabildo, Ricardo Melchior that there are plans for two new direct flights between Tenerife and Senegal and Tenerife and the Cape Verde Islands. Yesterday the President announced there are also plans in the pipeline, which are expected to be announced next weeks, for a direct air link from Tenerife to Miami. Once the flights are running there will no longer be a need for Tenerife residents to travel to any of the three destinations via Madrid or London.